Najibullah Ahmadzai was born 1976 in Paktia and he is a Pashtun. He earned his Master’s degree in business administration from India. He previously worked in the regional office of the Independent Election Commission in Paktia province, as well as he has experience of working with some private institutions. 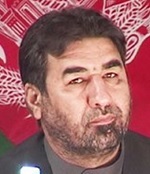 Ahmadzai is fluent in Pashtu, Dari, English, and Urdu.